So much of the inspiration for this story is based on historical facts. The characters, the places, the names, and even many of the objects are real. I’ve always been drawn to the mysteries of history and, surprisingly, both Egypt and Michigan are full of them. Horace’s name (which is also the name I gave my favorite stuffed animal as a kid) is connected to an Egyptian god and a famous resident in Niles, Michigan. Niles is a real town in the southwest of the state. It has a fascinating past dating to the early frontier first settled by the French. In the nineteenth century it was also an important stop on the Underground Railroad. An old museum called the Chapin House sits in the center of Niles, and houses many bizarre artifacts, including a two-headed sheep. Although the Michigan Relics never made their way to Niles, they were a real and unexplained collection of objects found in the state in 1890. The Egyptian artifacts and history mentioned in the story are real as well. The Benben Stone can be traced to the city of Heliopolis. The whereabouts of the stone remain a mystery, as does the location of Akhenaten’s burial site. Akhenaten and his city, Amarna, dramatically transformed three thousand years of Egyptian history before he died mysteriously, disappearing along with his city from the history books. The lost period of Amarna was only rediscovered in 1922, when Howard Carter stumbled upon King Tut’s sealed tomb in the Valley of the Kings. The discoveries inside opened a window onto a period of previously forgotten history. 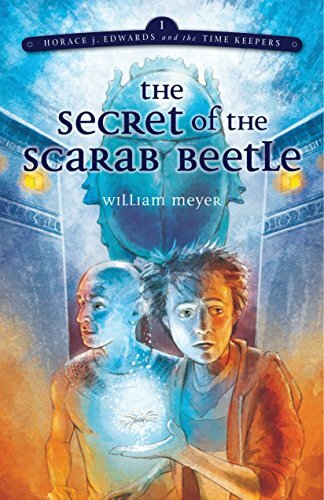 One of the discoveries, which left many Egyptologists bewildered by its beauty, was a blue scarab beetle.